Evolt.org is an international, non-commercial community of web, internet, and intranet professionals. Established December 14, 1998, evolt.org began as a breakoff group from Hotwired's monkeyjunkies mailing list. In March 1999, after months of planning amongst the initial monkeyjunkies breakoff group, evolt.org launched its main mailing list, thelist@lists.evolt.org. "thelist" is fairly general as far as web development lists go, covering everything from server operating systems to nuances of designing with CSS. The list has been historically characterized by its strong sense of community and its self-moderated style. Thelist continues today as the heart of the evolt.org community. For more information, see our list guidelines. 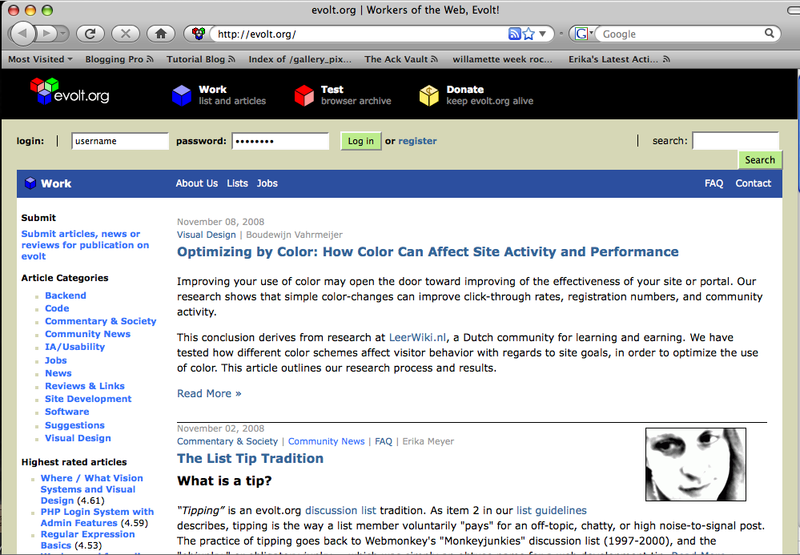 The first ("alpha") iteration of the evolt.org site (aka "w.e.o." for web evolt.org in evolt-speak) launched in the spring of 1999. 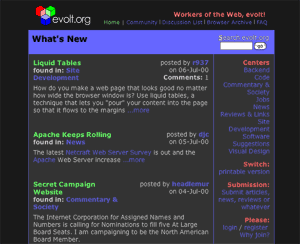 On June 1st, 1999, evolt.org re-launched its website as a place where web developers could see up-to-date and relevant news content about the web industry in general. The most applauded feature however, was that anyone could post an article in one of several "centers" or sections of the site that related to a specific area of web development. 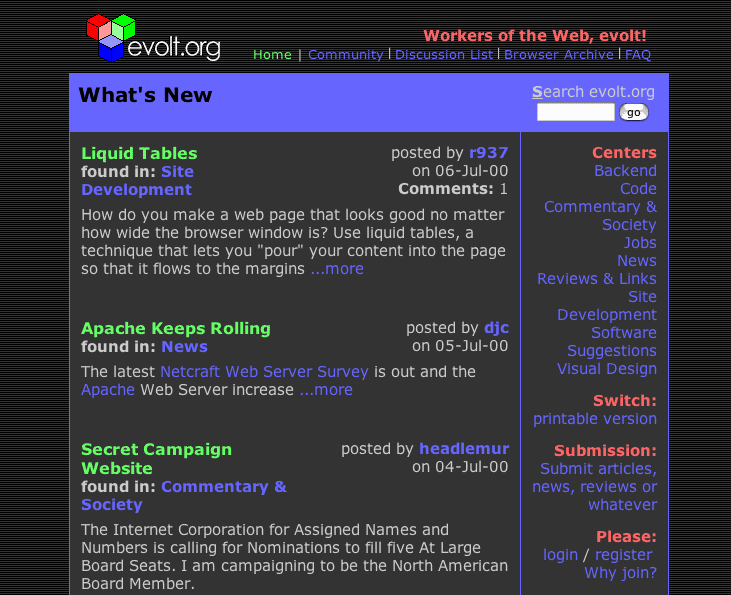 This 1999 site, generally known as "evolt 1.0," featured a distinctive dark background, with flat, bright, 8-bit fonts, and a "switch" button designed to pull up a reversed, printer-friendly page. 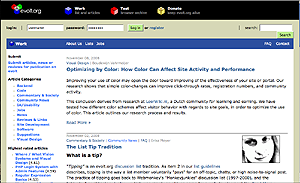 Influenced by late-90s "hotwired style," evolt.org embodied late 20th century geek sleek. 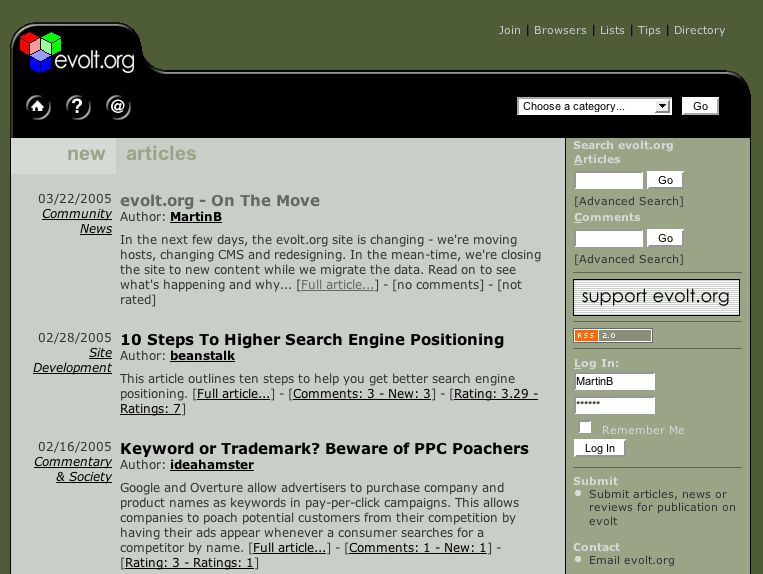 In December 2000, evolt.org redesigned w.e.o. to a "skinnable" site featuring an all-black bar across the top of each page, different colors for each site section, and CSS used for visual design elements. Site layout was still done in tables. This design was created by Isaac "isaac" Forman, with potential themes created by various evolt.org members. "Centers" were renamed, more intuitively, "Categories." Original evolter and long-time admin Adrian "aardvark" Roselli wrote in-depth about processes and concepts behind w.e.o 1.0 and 2.0 designs in the book Usability: The Site Speaks For Itself (glasshaus, 2002. Holzschlag and Lawson, Ed.). In 2005 we decided to migrate our database and CMS to MySQL/Drupal. Now, as we face our tenth anniversary in December 2008, evolt.org is once again in the midst of an upgrade/redesign process. Want to join the fun? Our original content management system was built in Cold Fusion over an Access database running on Window NT; later we migrated to Linux/Oracle/Cold Fusion, and then to Win2k/MSSQL/Cold Fusion. The evolt.org CMS was developed and maintained by coders in different parts of the world, with the occasional community-building "code-fests." Eventually, concerns about the accessibility and longevity of our system led admin members to choose a more powerful open source system: Drupal. We now host our site on Linux-based servers running Drupal over a MySQL database. Original admin Adrian Roselli's obsession with cross-browser testing led him to collect an archive of browsers, which he donated to evolt.org. The browser archive is currently maintained by William Anderson, aka neuro. Featuring goodies from Lynx and Mosaic to iCab and Opera to standalone versions of Internet Explorer, browsers.evolt.org (aka b.e.o.) has been an a popular destination place for web developers and curiosity seekers since the evolt.org 1.0. Enjoy, and download and install at your own risk. Since early 2003, evolt.org has provided hosting for the css-discuss (css-d) mailing list and website. Evolt admin are a group of individuals who contribute time, energy, and skills to evolt.org. The forum is our main admin list, and is open to all evolt.org members. Admin take on different responsibilities in the org based on expertise, time, interest, and experience. Over the years, evolt.org has experimented with different ways to structure our admin process, from electing leaders, to establishing committees. Ultimately, attempts toward a formal leadership process have given way to a more informal, consensus-based style. Just as our lists are self-moderated, the organization is self-led. While some offices are held by single individuals (for example, the office of treasurer, currently held by David Kaufman aka dkaufman) other offices may be shared. We have had to remain flexible with leadership, seeking a balance that works for us. evolt.org is only as strong as our members, and we are always open to having intelligent, energetic additions to our ranks.